Supermarine fell to another narrow defeat at Wheatsheaf Park as two first half goals either side of a Conor McDonagh strike were enough to win the game for Staines Town under new manager Rob Easom. Staines started very brightly and forced corner after only a few seconds when a fast paced build up play led to Dan Williamson making an excellent tackle to deny the crossing opportunity. The corner fell to George Pilbeam on the edge of the box, but his left footed effort was comfortable for Will Henry making his debut in goal for Supermarine on loan from Swindon Town. Half way through the first half, Harry Agombar was next to go close for The Swans as his curling freekick from 25 yards was brilliantly tipped over by Henry although from the resulting corner the home side had the lead as Agombar’s corner was powerfully headed home by Tanasheh Abrahams as he stole into the middle of the box to score his first goal for the club. Shortly before the half hour mark ‘Marine equalised when Henry’s long kick downfield was headed on by Mike Symons into the path of Stuart Fleetwood who crossed low for Conor McDonagh to fire home. The long ball undid the Supermarine back four once again this season when just two minutes later Andre Odetola played a long ball forward that Matt Williams couldn’t deal with and his soft touch put it into the path of Andy Ali who finished first time on the volley excellently past Henry from just inside the penalty area. McDonagh got behind the Staines back four down the left hand side, but he could only curl into the near post side netting. Symons thought he had won a penalty when he showed some excellent skill to turn a couple of Town defenders inside out and as he advanced into the area he was tripped by Wilson Chingoka but despite him falling in the penalty area, the referee deemed that the initial contact was outside the box. Michael Hopkins took the free kick, but saw his effort headed off the line by Ali. In first half injury time, Symons laid the ball across the edge of the area for Connor Thompson who hit his effort just over the bar. Straight after half-time Thompson crossed for Symons who controlled well turned and forced a good save out of Louis Dixon for a corner. From the resulting corner, the away side had another big shout for a penalty when a Staines defender handled the ball right on the edge of the penalty area. For a second time the referee deemed it outside and just a free kick was given on the line of the penalty box. Thompson hit a low effort towards goal, but was cleared to safety. Agombar curled a well worked short corner towards goal but Henry was once again alert to tip it over the bar as he backpeddled towards the far post. Makhosini Ryan Khanye should have done better when he failed to hit the target unmarked at the far post before Hopkins floated over a deep ball that Williamson got on the end of but his effort was comfortable for Dixon. As the game opened up and moved from end-to-end as the heavy rain continued to fall and was starting to hamper conditions, Chingoka turned inside Matt Williams and curled just wide of the far post. McDonagh hit the side netting for a second time when he pounced on a loose ball in the area before forcing Dixon into a near post save as he cut inside on his right foot from the corner of the box. Joe Shepherd went close with time running out when he shifted the ball over to his right foot and hit a low effort that Dixon did brilliantly to save and gather with Symons ready to pounce. 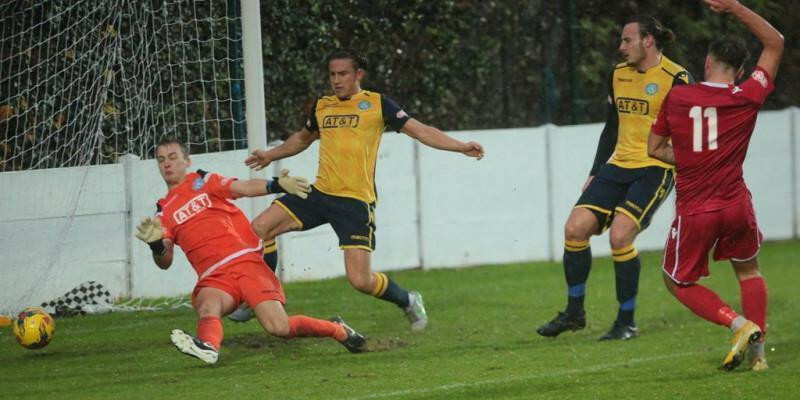 Staines could have put the game out of site with two minutes to play. As the visitors pushed men forward in an attempt to get something from the game, the higher line forced Henry to advance out of his goal, but he lost a 50/50 with Ali, the ball richoched towards the byline Ali collected the ball and crossed low for Thomas Gogo who took a touch before firing low towards goal, but Henry made another great save, this time with his feet to deny him. In the final minute Symons should have got something for Lee Spalding’s men when substitute Luke Williams floated over a cross that the on-loan Hereford hitman headed downwards and wide of the far post from six yards.